To assist in identification, most turn first to a stamp catalogue which illustrates and lists stamps by country and date, and also provides an approximate market value. Which catalog to use is a factor of the country where you buy and sell stamps, as well as your area of specialization. In the United States, the Scott Catalogues are the de-facto standard, while elsewhere in the English speaking world, Stanley Gibbons Catalogues published in the United Kingdom see wider use. Other notable worldwide catalogues include the German language Michel, and French language Yvert. There are also numerous specialized catalogue publishers that do not attempt to cover the world. 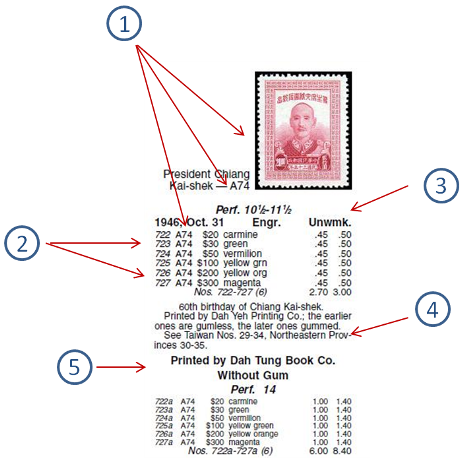 For example, recent interest in China philatelics has brought attention to the Chinese language Ma and Chan catalogues. A common feature of stamp catalogues is that they assign a reference number to each unique stamp. Of course, the reference numbers vary from publisher to publisher and so it is often necessary when communicating with collectors and dealers to specify which catalogue you are using. With the stamp trade now more international than ever before, it is becoming more common to see stamps referred to by the year and a descriptive series name rather than a catalogue number. Finding a particular stamp in a catalogue - and then confirming a correct ID - can be easier said than done. Sometimes simply determining the issuing country or finding a country in the catalogue is the first difficulty. For many countries, the name in the native language will be different from the name in your language, and a good number of countries now and throughout history use non-Latin alphabets that you might not be able to read. In these cases you need a resource conveniently named a "stamp identifier" which can often be found within a stamp catalogue or as a standalone website or pamphlet. The stamp identifier will provide translations from other languages as well as visual clues to assist in country identification. 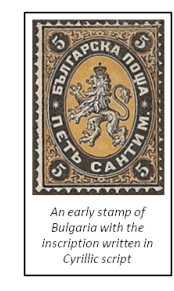 We have an illustrated identifier right here at The Stamp Collector website: The Worldwide Illustrated Stamp Identifier. If you can find the issuing country in your catalogue but can't find your stamp illustrated, there are several potential reasons to consider. The general worldwide catalogues do not typically illustrate every stamp in a series, but rather illustrate a representative stamp type for the series. Learning to recognize an non-illustrated stamp as a member of a series or set is something of an art form unto itself, but over time your intuition will develop. Also be aware that your stamp might not be a regular postage stamp. If the stamp was used for a special class of mail - such as airmail or special delivery - the listing might come in a special section after the regular issue stamps. If the stamp was used for non-postal tax or revenue collection then it probably won't be in a general purpose catalogue at all. For perhaps obvious reasons, the real challenge for stamp identification comes in the similar appearing stamps considered different by collectors. Frequently these stamps were not intended to be different by the government that issued them, but the differences were documented by philatelists. Here we'll provide an overview of the main distinguishing characteristics collectors look for in stamps, and the basic approaches used in identification. Design Variations - Magnification is often required to find variations in the basic illustration of the stamp. A good handheld magnifier is the mainstay here, but a computer scanner can be invaluable when studying finer details. You should note too that a general purpose catalogue may not always provide enough information to make a positive ID. Specialized catalogues, pamphlets, and journal articles are often required. Color - Classic stamps are frequently described by different color shades. Color is tricky because it is difficult to reproduce in reference books and you are often confronted with odd designations such as pink, carmine, lake, olive green, or red violet. Color guides are available, to help in making determinations. With both design variations and color, the very best reference can often be stamps from your own collection for comparison. A green stamp might be very obviously "bright" green when side-by-side with its "dark" green cousin. Perforations - Perforations and other separations are generally defined by the number of holes per two centimeters. While it is possible to use a common ruler and count the holes, specialized perforation gauges are available that make the job much easier. It is not uncommon to see compound perforations in which the horizontal and vertical counts are different. The convention here is to list the horizontal count first, such that a stamp described as 14 x 14.5 would measure 14 holes per two centimeters on the horizontal edge and 14.5 holes on the vertical edge. Watermarks - The use of watermarked paper was once a very common security measure. However it was equally common to see different watermarks in use over the lifetime of a stamp issue and collectors will want to collect them all. It was also common for paper to be fed through the press in different orientations resulting in sideways and inverted watermarks, again producing collectible varieties. Watermarks can be very difficult to see, especially on single used stamps. Occasionally a watermark can be seen by holding the stamp to a bright light or setting it down on a dark surface, but this is the exception rather than the rule. To see watermarks more clearly, collectors use watermark detection fluid and a small black tray. The stamp is placed face down on the tray and covered with the fluid. This technique reveals the watermark without damaging the stamp. Printing Methods - Historically there are three main methods of stamp printing engraved, typographed, and lithographed. With engraving the stamp image is etched into the printing plate the result being that the ink of the printed image is raised from the paper. With typography the image is raised on the printing plate the result being that the image is impressed into the paper as if it were stuck by a typewriter. With either engraving or typography the difference should be visible under light magnification. The vast majority of modern stamps are lithographed. In lithography images lay flat on the paper. Early lithographic images were fuzzy with poor resolution. Although contemporary lithographic techniques can produce intricate, multicolored images, under magnification they still lack the sharpness of engraving or typography. Released June 6, 2012 this attractive four stamp set features native Taiwan owls.